Only, along with all this happy events, came an unwanted surprise. Allergies. LOL. I had taken a test a couple of years back, while still living in NYC. I found that I was allergic to oak, birch, beech, ash and maple and basically nothing else, including food (I thought I may have been allergic to wheat, which, was the prompt, but no!). I promptly forgot about it because where are these trees NYC? No where I know! not even the parks. Ah! But Connecticut now is a different story. These are all the native trees of the New England region and my yard alone as 3 of these varieties in ABUNDANCE! One fine sunny morning., last week; I walked outside with a big smile, face tilted up towards the sky, breathing deep and slow…. And like a hit and run, I was down in a second. I folded into a fit of sneezes and tears; and ran right back in. None of my previous gentle medications worked! Well, my body had not been assaulted so much before. The unseasonable warmth had triggered an early pollen blanket and the oaks were particularly prolific. I was bad enough to have to stay indoors, actually, laid up in bed feeling rather very sorry for myself. Tiny feet cheered me up a whole ton; but I was still mopey as I watched all the runners taking advantage of the sunshine and me just sneezing even more at the sight! I use my basic chocolate cake recipe to make these donuts. As it happens, it works well with both regular and gluten free flour blends. Mix everything together to a smooth batter. Let cool on rack for 15 or so minutes. While the donuts cool, melt the chocolate over a double boiler. Once melted, fold in the rose water. 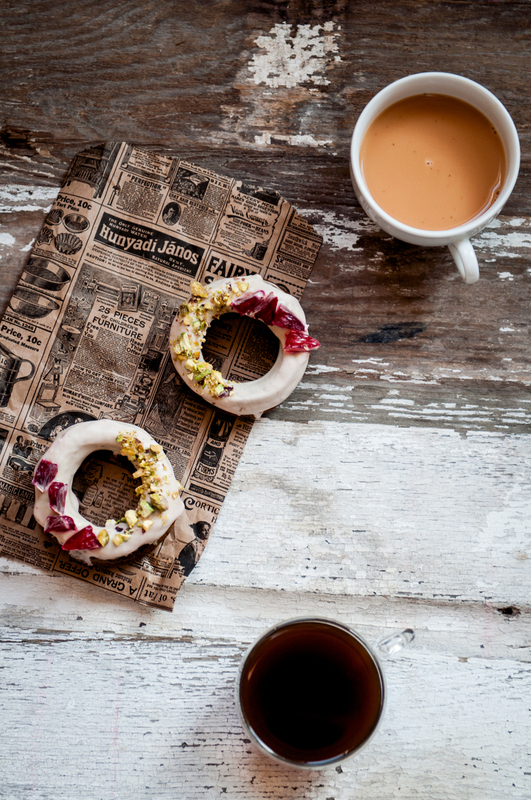 Drizzle the rose chocolate over the donuts and sprinkle the dried rose petals over.